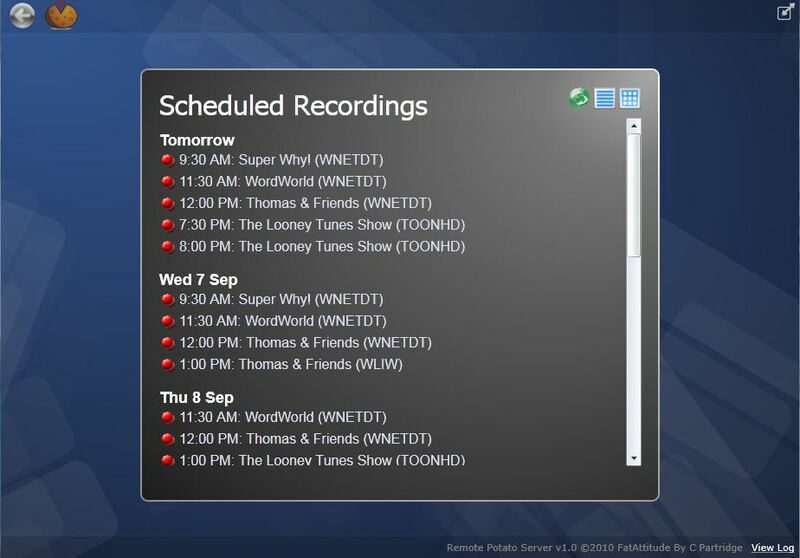 Short of taking screenshots of the WMC Scheduled Recording display, does anyone know of a program or a way to print out the list of upcoming scheduled recordings? This can be done with Remote Potato's web interface, although I don't think the website to download it is up anymore (you may be able to find a copy, if not I may have one). There may be better ways of doing it. I normally use the Silverlight interface, but the web interface is similar and can be printed. It only lists dates, start times, and show names (no episode name or other information). It does not list the channel name. It uses Monday, Tuesday, Wednesday, etc. for the "date" instead of the date like "Mon 14 Apr" for the first 7 days, then it uses the date. It lists them all on one web page so it is easily printable or savable. One issue I might mention is that very rarely, it misses an entry. I have only seen it a couple times in the years of using it and I have no explanation as to why it misses it. Also, if you generate the list within 5 minutes before a show is about to record, it will also leave it off the list, however if you refresh the list after it starts recording, it will be back on the list and only removed once it is done recording. Thank you for your comments. I'll look into both ideas. I'm sorry it took so long to respond back to you two but a small EF0 tornado wiped out our power and Internet for 4 days. No one hurt just a window blown out, fence blown over, trees toppled, and siding dislodged. Certainly not something you would expect in a mountainous section of Pennsylvania.